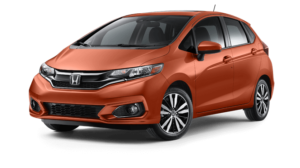 This year, the 2018 Honda Fit will make its way to the marketplace with the promise of delivering a newer, sportier style, higher performance, and even more interior and safety amenities. Drivers searching for a compact vehicle with huge performance potential will be delighted by the 2018 Honda Fit. Continue reading to learn more about this year’s restyle and performance enhancements. They say, “if it’s not broke, don’t fix it,” but the 2018 Honda Fit is breaking the rules and enhancing their already amazing iterations of the vehicle this year. We’re most excited about the sportier style that the vehicle will take on with the help of some stylish exterior additions. The all-new two-piece chrome and piano-black grille, 16-inch machine-finished wheels with gloss black inserts, and much more helps to create the new look. Oh, and we can’t forget about the exciting new exterior color options: Helios Yellow and Orange Fury. The addition of a new Sport trim is also especially exciting and comes with its own set of great assets and upgrades. There have also been slight modifications made to the vehicle’s measurements that will assist in making it even more high-performing, such as a slightly longer chassis, lower and wider appearance, and aero form features on the front, side, rear, integrated fog lights, and low front splitter. When the doors open, drivers are greeted by a full black interior with cross-hatched fabric for the seats and door trim. The Sport trim of the 2018 Honda Fit is prepared to deliver a truly sporty driving experience to those who take the wheel. You’ve never seen a Honda Fit like this, and you surely won’t want to miss your chance to make it happen. Make sure that you’re one of the first to drive off in one of these stellar new 2018 Honda Fit models as soon as possible by visiting your local Capital Region Honda Dealer. You can also contact us online to learn more about the vehicle, financing, and current offers.